Welcome to 24/7 Sudoku -- the best in free, online sudoku games! 24/7 Sudoku offers all the difficulties a beginner or seasoned sudoku player will enjoy! This free sudoku website features hundreds of Easy Sudoku puzzles, Medium Sudoku puzzles, Hard Sudoku puzzles, and Expert Sudoku puzzles! 24/7 Sudoku is sure to keep you playing this great sudoku game all day, every day! Sudoku is a brain challenging number game, played on a 9x9 sudoku board. The sudoku board is broken down into nine 3x3 squares. The object of the sudoku game is simple. Every row, column, and 3x3 box in the sudoku board must contain the digits 1 through 9 only once! As the difficulty progresses, the sudoku game becomes harder, and you'll have to employ more advanced and strategic logic to solve the puzzles. 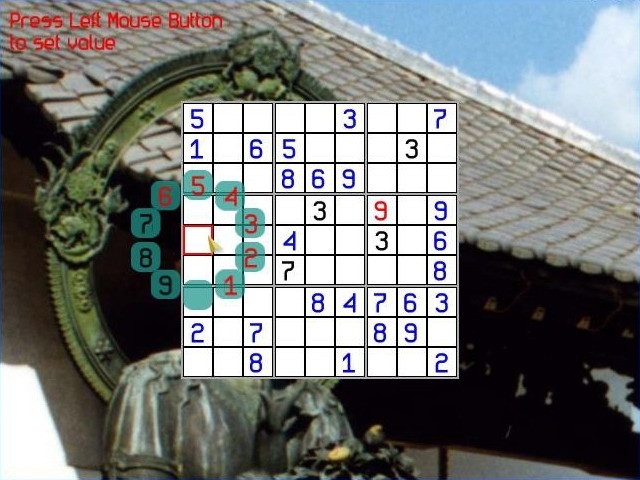 To play 24/7 Sudoku, employ the basic object of the game by clicking an open space and either typing the number that belongs, or selecting it from the numbers on the side of the sudoku board. If the number is correct, the sudoku tile will slide into its correct slot. If not, the number will return to the outside and time will be added to your overall sudoku game time. To highlight numbers, click a number that has already been placed inside the sudoku puzzle. As the game progresses, you may want to use notes. Click the pencil in the right bottom corner to turn the numbers into notes. Just click it again to return to puzzle number form.